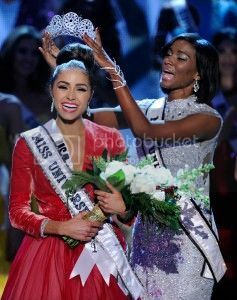 Congratulations to all the winners in Miss Universe 2012 held at Las Vegas, Planet Hollywood Resort and Casino. This year Miss Universe 2012 is Olivia Culpo of Miss USA followed by top winners are: Janine Tugonon, Philippines (1st runner up), Irene Sofiá Esser Quintero, Venezuela (2nd runner up), Renae Ayris, Australia (3rd runner up) and Gabriela Markus, Brazil (4th runner up). Culpo takeover the place of last year's winner Leila Lopes, Miss Universe from Angola. Culpo will travel the world for the next year representing the Miss Universe Organization and a charity of her choice. Special Awards for Best in National Costume goes to Miss China and this year Miss Congeniality is from Guatemala the Miss Photogenic goes to Diana Avdiu of Miss Kosovo. Below are the selections of finalist in the pageant! The contest takes a moment of silence for the 20 children and six staff gunned down at Sandy Hook elementary school in Newtown, Connecticut, on Dec. 14.